A brief introduction to the founder of Holistic Body Training. Frank was introduced to health & fitness at an early age when the whole family used to go running, adventuring and training together, led by his father - a cross country runner for the RAF. A boyhood also filled with wrestling, football, & swimming, (both in the pool and out - what they now call 'wild swimming' - in rivers, lakes & the sea). Holidays entailed navigating (Literally - as a nine year old+ in the front passenger seat in his mothers lap, map in hand), round the whole of the mainland coastline (bar the top end of Scotland), as well as inland Wales, Lakedistrict etc. to take them orienteering, climbing, canooing and anything else that came their way. At school the careers officer was informed he wanted to be a stuntman, and his first introduction to martial arts came with the fencing foil and kickboxing, closely followed by judo at college. A family move 'up north' introduced Frank to Karate, which he studied for over 10 years, along with other martial arts. During this time, in 1980, he completed a Barefoot Run for charity from Scarborough to Blackpool (approx 130 miles!) with other members of the Cobra Karate Club. In 1991 he opened what was possibly the UK's first true multi style martial arts training centre, hosting over 10 different martial disciplines under one roof. At this time he also formed his own style of martial arts called Tobu Jiyu Jutsu - or Fly Free Art (art without constraints) which is the basis for Urban Combat. An introduction to yoga and nutritional studies were added to his list of passions and took his understanding of health & fitness even further. From fitness yoga he progressed to Ashtanga yoga, a dynamic and flowing form, and later he took his exams to become a qualified yoga teacher. 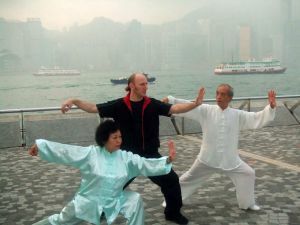 The blending together of all these elements along with meditation and Chi Gong has led to the formation of a truly holistic system which he has called Holistic Body Training. 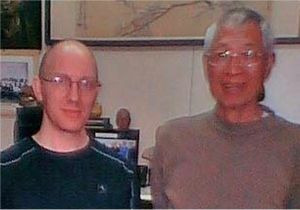 Always looking to improve, Frank took a 'working holiday' early in 2007 to Hong Kong, after securing a letter of recomendation from his Sifu William Lai, where he was honoured to train with Sifu's teacher Grand Master Choy Shun Tin, the worlds leading Wing Chun master. (Wing Chun is a Martial Art developed by a female monk from the famous Shaolin Temple, that utilises the body's alignment and sensitivity to overcome the opponents force & balance, - to redirect the incoming attack - using skill to overcome strength). Marrying a Bournemouth girl in 2008, he has settled between the Jurassic coast and the New Forest to call Bournemouth his home. In 2010 he formulated the ‘Every man list’ which was later to become the ‘Active Body Challenge’. It was also at this time that he started taking the very successful 'Yoga on the Beach' sessions, between Boscombe and Bournemouth piers. In July 2011 he became a father with the birth of his first Son. In 2011 he started to put together his Safe & Sound programme. October 2012 saw Frank completing the Level 2 MovNat Trainers course in London to become one of only a handfull of certified trainers in the UK. MovNat has a similar ethos to Holistic Body Training in that it uses natural body movements to maneuver through and manipulate our natural environment, keeping fit in the process. Highly practical, efficient and effective. November 2013 saw Frank completing his family with the arrival of his daughter. With the passing of years (now 59) he is focusing his efforts on aging well, and into the continued developement of the highly successful Safe & Sound, Music and Movement chair based exercise programme and classes for maturing adults to help spread his knowledge and experience to enable others to enjoy life to the best of their abilities for the whole of their lives, not just their youth. He has also joined ISMAA - Inner Strtength Martial Arts Academy run by Shaun Lanham and started competing again after many years. In November of 2018 he competed in the World open karate chamionships at Crystal Palace in London and won a Gold medal in kata. The week after at the ISMMA opon championships he managed a podium position (Silver kata & kumite) to secure a place in the team to represent England in India later in 2019. Becomming known as the 'man with the toes', because of his shoes, a busy schedule now sees Frank expanding his 'Safe & Sound - Music & Movement+' chair based exercise classes across Dorset with a view to rolling them out nationally. His continued research expanding into dementia and Altheimers control and prevention. He is also giving talks on 'Health and Fitness', presenting his highly acclaimed 'Personal Self Defence' courses, as well as delivering the 'Yoga on the Beach' sessions during the summer, yoga classes year round, MovNat workshops and teaching Holistic Body Training in all its elements full time.